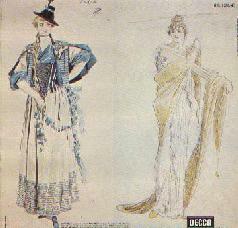 Rear cover of Decca SKL-5239/40, showing costume designs from the original production. 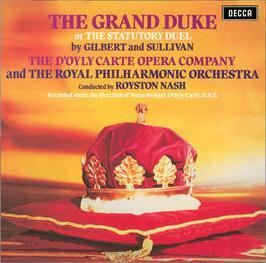 The London and Decca issues had the same front cover, shown above, but this rear cover was seen only on the Decca LP issue. In 1975, to celebrate centenary of Trial By Jury, the D'Oyly Carte Company gave a gala two-week season at the Savoy during which all the operas were presented in the order originally written. Utopia, Limited received a new production (the Company's first since the early 1900s), but The Grand Duke was performed only in concert. This recording was made at about the same time. 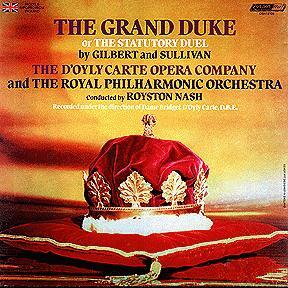 Before this recording was made, perfornaces of The Grand Duke were practically unheard of. A Gilbert & Sullivan Conference at the University of Kansas in 1970 drew visitors from around the world, in large measure because a production of this opera was featured. (That production was also recorded). In 1970, The Grand Duke was an opera that many G&S fans thought they might never see. The D'Oyly Carte recording spearheaded a dramatic change in the opera's fortunes. While this opera will never be regarded among the partnership's best, anyone who hears this recording is bound to come away persuaded of the opera's many charms. Most amateur societies with sufficient resources have produced it at some point since 1976. 2003 Decca CD 473 631-2 24-CD set including the complete Decca G&S series on CD (13 G&S operas, plus Cox and Box and The Zoo).